Have you ever wished to have a system that could help convert your Airtime credits to cash or transfer airtime to Bank account? Well, Zoranga is an online platform that has made it possible, find out how it works in this article. My best response is Yes. Based on experience, I have converted airtime to cash on Zoranga a couple of times, So I can boldly tell you that the site is legit. My quest to look for a way to transfer airtime to Bank started the day I tried to transfer 5000 Naira to a friend via GTB but mistakenly dialed *737*5000# which automatically loaded my phone with 5000 Naira airtime, The zeal to convert it to cash came immediately and that was how I came across Zoranga.com. Zoranga.com is an online platform that allows you to receive and send money without visiting a bank branch. The simple logic is that it allows you to load your Zoranga account via airtime transfer, then you get the option to transfer the credit to Bank account of your choice. The airtime will be converted to money in your Zoranga account, after which you can then decide to convert the airtime to cash into any bank account you wish, it is as simple as that. 1. 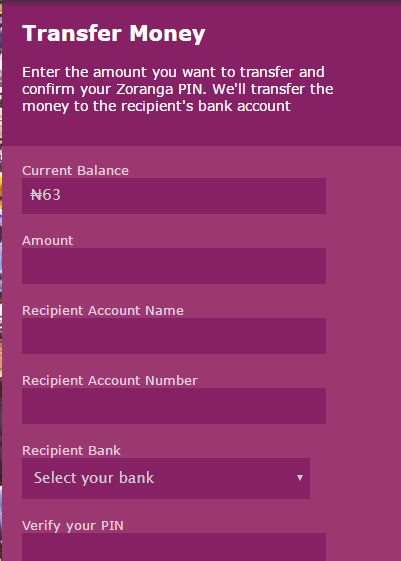 Log-on to Zoranga.com and Create an Account. 2. 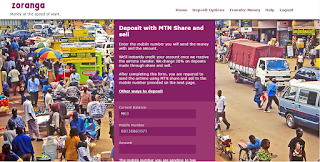 Click "Deposit Money", You will be provided with Options to "Deposit via PIN", "Zoranga PIN" or "MTN Share n Sell". 3. Select "Deposit via PIN" if you have the PIN for the Airtime or "MTN Share n Sell" if you have already loaded an MTN Recharge card on your MTN line and wish to convert it to cash. 4. If you've selected "MTN Share n Sell", Enter the mobile number that will be sending the Airtime and the amount you will be sending then take note of the MTN line you are instructed to transfer the airtime to. 5. After successfully transferring airtime or entering the Recharge PIN, wait for 5 minutes then refresh the page to reflect your added funds in your Zoranga Account. 6. Now that the deposit has been confirmed, Click "Transfer Money", and enter the bank details you would like to send the money to ...wait for 48 hours to receive the alert. NB: The amount of airtime you transfer or PIN recharge you enter is not the exact amount that will reflect in your Zoranga account due to various service charges that will be deducted. The service charge is 20 Percent of the amount of Airtime you are loading or transferring to your Zoranga account. DISCLAIMER: Kindly note that Inforisticblog.com is not in any way affiliated to Zoranga.com. I have only tested their service and it worked fine so I decided to share the information with you. To be more specific, your transaction with the site is at your own RISK. does it only work in nigeria or all countries??? ?